This is the last episode we are doing from the book Traditional Quaker Christianity. We’re talking about integrity. This ties in a lot to our last episode, which was on plainness. People often use “integrity” and “honesty” interchangeably, but integrity is bigger. It means wholeness or completion. What’s whole? Well, you could say it’s our lives or our relationships with God. But the temptation to separate parts of ourself off is huge. We need integrity in order to let our lives preach. Integrity might require a person to attempt conscious consumerism, but then good luck figuring ethical consumption under capitalism. There are too many layers to producing goods. Integrity might also require changing the media we consume. If certain media makes you less sensitive to the Light, should you avoid it? Raise your hand if you were a Quaker kid who couldn’t watch GI Joe or play with Nerf guns. 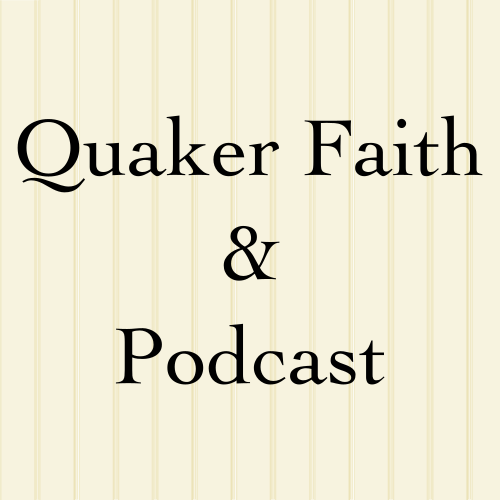 Mackenzie: Welcome to Quaker Faith and Podcast where we will explore traditional Quaker beliefs and the variety of Quaker beliefs found today. Mackenzie: Welcome back to Quaker Faith and Podcast with Mackenzie and Micah. We are going to be finishing out this book with Section 7 of the book being Traditional Quaker Christianity with Section 7G, which is on integrity. This is strongly related to the last episode we did, which was Plainness and Simplicity. Actually as I was reading this chapter, Micah was going, “Wait but this is simplicity again.” So, I think I want to start with saying that integrity and honesty, while they are frequently used interchangeably, are not actually the same thing, and so integrity also means wholeness. Micah: Is honesty a part of integrity? Mackenzie: Yes, I think honesty’s a part of integrity but that integrity is a larger thing. So, you can talk about the integrity of an object, meaning it’s not broken, it’s whole or complete. Mackenzie: I think integrity is probably ultimately the sort or overarching thing when it comes to Quaker testimony, because it’s about our wholeness with God or the completeness of our surrender to God. Micah: Which means we’re not broken into pieces, but all of our life is one piece. Mackenzie: Sure, or we’re not separating off parts of ourselves from God in order to keep them in an ungodly way, I guess if you want to put it that way. Mackenzie: No, we call it perfection. Micah: Well, sanctification, perfection, the process of sanctification or perfection is ongoing and it’s a process of … You have this initial experience or something … it’s always been more gradual, but you have this experience of God showing you things you needed to know, showing you things about yourself, and you are ready to change, and you give him power to change. Then it just keeps coming. God keeps showing us parts of ourselves that we didn’t even consciously see before, but now we can see our sort of strongholds of resistance within ourselves to God. Micah: “Surely I’ve arrived.” These things just keep coming, and the more I see, the more brokenness I realize is there. So, thinking about integrity, I think in my experience and I think in the traditional Quaker experience, integrity like sanctification is a process. It’s almost like I’m this shattered vessel, and the pieces are slowly being put back together by God. It’s unclear when the vessel is whole again. 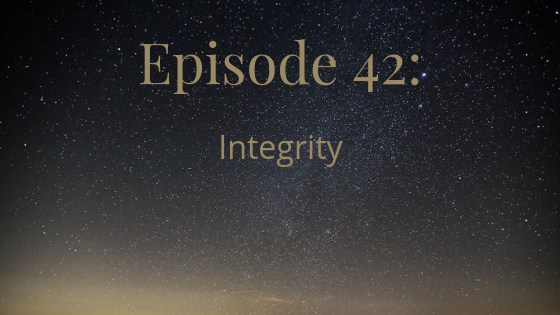 Integrity is challenging, because I think there’s no end to it, but I think integrity is also easily confused for sort of a human perfectionism. Micah: I think of people like me who want to make sure that, for example, everything … maybe we want everything we buy to be sourced from an industry that’s pure. We want to make sure our clothes don’t have slave labor. We want to make sure there’s not too much packaging in the things we buy, because that would be wasteful, environmentally destructive. We want to make sure the workers are well paid, et cetera, et cetera, and on, and on, and on. I think most of us have run into this brick wall like, “Oh my goodness, there’s no way to verify my supply chain.” There’s no way to live this life of, “It’s not enough for me to be perfect. I need everything I consume and experience to be perfect too.” Then there’s no end to it. Micah: So, I think that while the integrity that God gives us is humbling, it’s humbling, and empowering, and life giving, the sort of false integrity that I think a lot of us seek sometimes, I know I do, is both … What’s the opposite of humbling? Micah: Spiritual pride. At the same time as it makes us more self-aggrandizing, it also leads us to despair because there’s no way we can make ourselves this perfect thing that we’ve imagined in our mind and make everything pure. Right? Mackenzie: … deeper, or lower level, or whatever … more detailed stuff. Mackenzie: That’s the response that we sometimes see to various political things where somebody says, “Well, it’s been that way forever.” Okay, but we’ve noticed now. We can do something about it. Right? So, if the things that you’re consuming are pushing you away from that sensitivity to the Holy Spirit, then maybe you need to stop consuming those things is a decision someone could make. Mackenzie: Which is, by the way, what, like, 50 miles from us. Mackenzie: Well, but then you could also think of … from the perspective of the people who are doing the shooting, what got them to the point of feeling like it was okay to do. There are certainly plenty of Christians who refuse to watch violent TV, movies, et cetera, because they don’t want to have violence normalized inside their own minds and hearts. Micah: Right. I guess where I was going with this was just that in the circumstance, it’s tough to even know if I want to stay tender to these things. There’s some wisdom in not focusing on things that you can’t control. It feels at this point like what can we possibly do [crosstalk 00:09:41]. There’s nothing that feels … This may be wrong, but it feels like there’s nothing to be done, like when you’re just stuck. Mackenzie: Yeah, buy a bunch of cloth or buy a bunch of wool and knit it or whatever. Micah: Right. At a certain point … Again, I feel like I’ve said this in another recent episode, you’re not called to die on every cross. To make your life sort of morally perfect in your entire supply chain would be more than a work of a lifetime. Even if you dedicated yourself full-time to doing it, it would be very challenging. Most of us need to work for a living. Mackenzie: Right. I think the part where the intro of this chapter talks about how those things affect your sensitivity to the Holy Spirit, I think that’s an important point there then. If getting “pure clothing” isn’t going to change anything about your heart, then you’re not really focusing on something that they would say matters, especially since it’s an unreachable goal. You can’t really stop the situation that exists regarding the Clothing Industry by just simple conscious consumerism, and it’s not doing anything good for your soul. So, between the two of those, why bother, right? Mackenzie: The book though gives examples of choices that we make that … Well, it talks about how those decisions that we do make could influence other people though. Mackenzie: He gives an example, say, about the clothes you wear, but it also talks about what car you drive, like SUV with gas guzzling, “Hi, I drive an SUV,” versus a Prius, which I used to drive. What’s that say about the environment? There’s a significant section in here on sarcasm, which we were discussing. Micah: Oh, right. Yeah. The book is very against sarcasm. Mackenzie: Yes, it is, as being not plain speech because you’re saying the opposite of what you mean. They say that it often results in somebody responding back with more sarcasm, which I don’t know if that’s really true. Mackenzie: They think it’s especially hurtful for children, because it undermines their natural sensitivity to truth. You were saying that you think that’s kind of true for your son, right? Mackenzie: Which, frankly, is how I respond basically when my husband is sarcastic, because my husband has a fantastic deadpan. I know he’s being sarcastic is that what he said is completely ridiculous. Micah: Mm-hmm (affirmative). I don’t know. I do definitely think there’s a form of sarcasm, and to be honest, probably most of sarcasm, it falls in this category, which is funny but not joyful. I think probably we do want to avoid funny but not joyful, things that are funny because they’re awful. Mackenzie: I know my husband strongly objects to any movie that includes embarrassment comedy, you know, laughing at somebody else’s expense, which is a genre of movie that I definitely grew up watching a lot of, like Adam Sandler movies, Chris Farley movies. Mackenzie: Those are all about somebody got hurt or somebody got made a fool of, and this is hilarious. Mackenzie: I know my husband … Okay, I am a nerd. I married a nerd. This should be no surprise to anybody then that there would be experiences of bullying. So, when you’ve been bullied, then I understand that making you more sensitive to the embarrassment thing. I guess you could kind of see that as a witness of his that that’s not okay. Micah: Yeah. I think as a general life practice, being a complaining person is not healthy. As someone who’s hopefully a recovering complainer, I think … I’m not sure I agree with the book that sarcasm per se is not a good thing, but I do think sarcasm especially in our society, we’re in a very sarcastic society. It’s a distinctive form of American humor. I do think sarcasm can be a vessel and often is a vessel for a lot of really unhelpful sentiment. So, I think that’s something to be aware of. Mackenzie: Let’s see, what else is in here? I guess there’s a next part of what’s here in the book is talking about relating to the simplicity thing we talked about last time, avoiding the distractions and waste popular entertainment. I just said about my husband having a no embarrassment comedy rule about movies. So, something that I’ve been thinking about lately, especially as more and more … what are those, Avenger movies come out, is I know that I can take or leave them. I go to those because my husband and his family are really into comics, and so they want to see the comic book movie and so I go along with them. Micah: I don’t go see many movies in the theater period just because it’s not something I’m that into. Now that we’ve got little kids, it’s really logistically hard. I would say, I feel like a lot of movies, particularly the ones in the superhero … Superhero movies are almost universally … I feel that superhero movies almost universally have a bad message, because the basic message of most superhero movies is evil has emerged. Who will come and violently kill them? Who will save us through violence please? That’s the message. It’s like redemptive violence. If you haven’t picked it up from our prior episodes, that’s not a message of Quakerism, that’s not a message of Christianity. Mackenzie: Right. I was reading the book A Long Road by Phil Palmer, and there’s a bit in there where, I don’t remember which … He was talking about atonement and how different theories of atonement, depending on if you’re looking at Evangelical friends versus Hicksite in the 1800s, but he said in there something about nonviolent atonement through Jesus’s sacrifice. I had this moment of thinking of Harry Potter, because Harry went off to Voldemort thinking that he was going to die but that he would sacrifice himself for his friends. Mackenzie: I was like, “Oh, see there’s a good versus evil thing,” where throughout the Harry Potter series, he’s protected by his mother’s love for him. The only thing that Voldemort can’t stand is that love and that sort of stuff. There is still plenty of violence in Harry Potter, but there’s much less of a violence is the answer thing. Micah: Right. Yeah. Violence is sort of a reality in that story, but it’s not the message. Mackenzie: Right, which makes it interesting that so many Evangelicals really hate Harry Potter. Mackenzie: I think with that, we’re going to conclude our wander through of Traditional Quaker Christianity. That is not to say that this is the end of the podcast, because we do still have another listener request to do. Then we’re going to be doing some planning and figure out what else we’re going to talk about, because there’s still plenty of other things to talk about. Micah: There’s a lot to talk about, but next up is going to be talking about the afterlife. So, if you wondered what Quaker’s think about the afterlife, you might find out in our next podcast. Mackenzie: You can find us on the web at QuakerPodcast.org. That’s QuakerPodcast on Twitter, Facebook, or Patreon, and on iTunes.